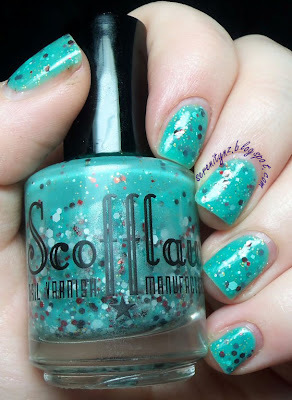 Today's post features a polish from Scofflaw. Scofflaw is a small indie polish company based in Chicago, USA. If you haven't tried them yet you should try and pick one up, they make amazing polishes, the glitter combos are fantastic and the formula is always amazing. Whiskey Tango Foxtrot is "a teal jelly base packed with red, white, gold and brown glitters of various shapes and sizes". This swatch is three coats with one coat of top coat. I did find that the glitter sunk a little in the bottle, so it did require a good shake. Scofflaw is available in the US via her etsy store, or internationally through Llarowe and Femme Fatale (soon to be shipping worldwide).